I realised the other day that I have all manner of little posts, podcast contributions and the like spread around the net where I’ve made small contributions or guest appearances on various forums. While I’ve mentioned at least a few of there on here at one time or another, it seemed sensible to put them all if one place if only so I could find them again. Still, at least a few readers might be interested in some of these so I thought I’d make a post out of it and leave it here. I can’t find / remember everything so actually if you do know of something I did that’s not here, err, can you let me know? 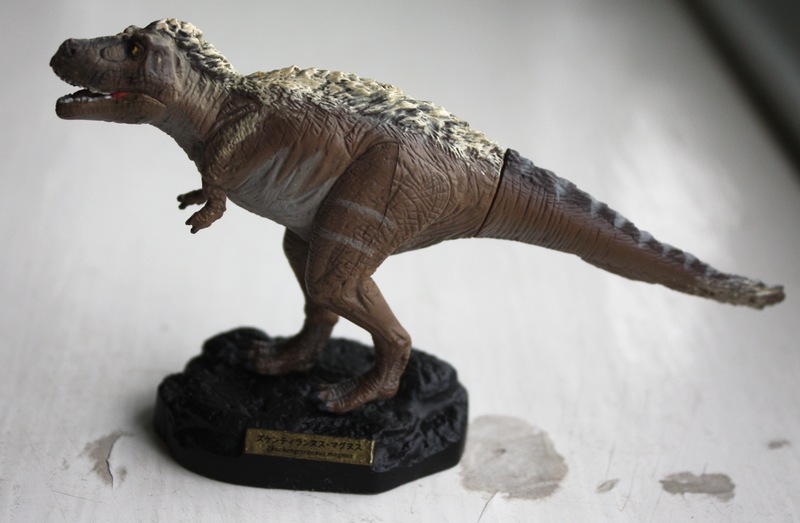 As I have noted on here before, the Japanese really do love their toy dinosaurs and produce really high quality models on a regular basis and of all kinds of obscure and wonderful critters. 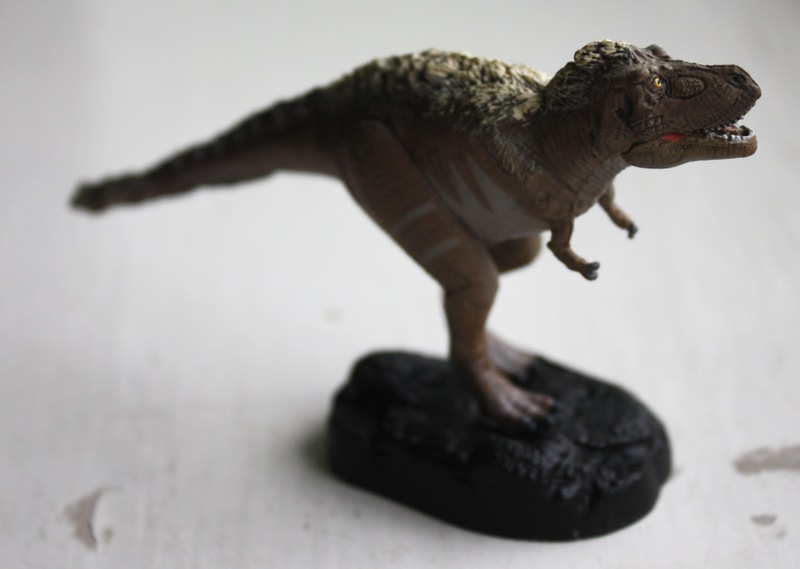 So when a couple of weeks back I got a cryptic e-mail from Matt Lammana of the Carnegie about having a gift for me from China connected with one of ‘my’ dinosaurs, I did have to wonder if, just possibly, there might be a Zhuchengtyrannus out there. Last night I found out that indeed there was. It had arrived through the post while I was away at SVPCA (more to come there) and well, how can I not be more chuffed. 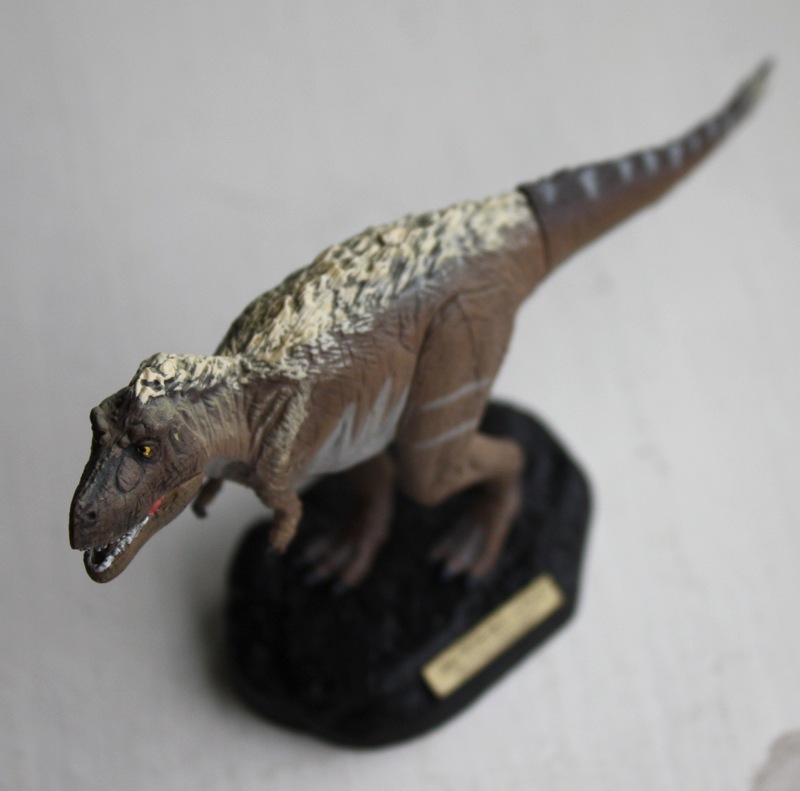 There’s a real toy Zhuchengtyrannus!! It’s tiny (just 10 cm or so) but obviously well modeled and the paint job ain’t too bad either. Rather obviously taking the lead from Yutyrannus, it’s on the fuzzy side of feathering too. Now obviously the holotype is incomplete to say the least, and so we’re left with a rather typical tyrannosaurine for a model really. Still, I *know* it’s a Zhuchengtyrannus as, if you look closely, you can see it’s written on the base. My thanks of course to Matt for this wonderful little present, made my day to say the least. On a not entirely unrelated note, there’s a palaeoart event going on at the NHM next week in conjunction with the Dino Art book launch. See here for more details. I hope to be in attendance but Luis Rey, Bob Nicholls, John Sibbick and others will be there. Regular readers will know that for the last few years I’ve been slowly building a research profile concentrating on the behaviour and ecology of dinosaurs and pterosaurs. 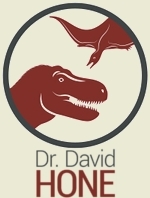 While the various papers on feeding behaviour, stomach contents, predation and niche partitioning in theropods has been the more high profile, I think the work on sexual selection is arguably more important as it potentially has profound implications for how we interpret all manner of fossils and how they may (or may not) relate to one another. After all, there’s a major ecological and taxonomic difference between identifying two species of a clade, and one species that exhibits major sexual dimorphism. My colleagues and I have already looked at the idea that sauropod necks were driven by sexual selection, and after much strife, finally got a paper published discussing mutual sexual selection and the implications that has for diagnosing taxa in the fossil record and what it might mean for parental care and other aspects of behaviour. There’s more to come in these areas as I have further work planned and am involved in some other areas linked to this, so the area is growing rapidly and, I hope, ripe for a general revisit in the literature. However, while these papers have in large part being about drawing out some false assumptions in the literature and providing new hypotheses about sexual selection that could be looked at in the fossil record, they were a bit short on how this could be done, and were if anything, narrow in focus (not that Ornithodira is a small group, but its got nothing on Animalia). So then to a paper in TREE that came out yesterday online. Led by entomologist Rob Knell, it also includes Darren Naish and myself and attempts to provide a review of the entire question of sexual selection in the fossil record. We look at ways in which this could be diagnosed, some false dichotomies and assumptions that have been put forwards in the past, try to identify some key features that may help diagnose sexual selection and look at some of the more convincing cases for this that have been put together to date. Clearly there’s a limit to what we can get into under 10 pages for what is supposed to be a review, but I think there’s some nice synthesis in there and a bit more “we can try doing this”-type stuff, that just covering what has been said before. Anyway it’s out and available (though behind a paywall, sorry) so go take a look. Knell, R., Naish, D., Tompkins, J.L. & Hone, D.W.E. Sexual selection in prehistoric animals: detection and implications. Trends in Ecology and Evolution, in press. Peter L. Falkingham, at Brown University, USA, and at the Royal Veterinary College, University of London. Focusing on computer modelling of dinosaur tracks. 1. What first got you interested or involved in your research field? I’ve just had a run through past Academics on Archosaurs, and well, like pretty much everyone else I’ve been into palaeo (and not just dinosaurs) since I was, as my mother used to put it, “knee high to a grasshopper.” As to my specific field, dinosaur tracks, that came much later. Like many other children tracks flew under my radar, with mounted skeletons and artistic reconstructions taking all my attention. I have a fondness for computers though, and during my undergrad I started getting into the computer-based biomechanics research that was going on, and felt that would be a good way to go. I eventually got a PhD on the computer simulation of dinosaur tracks, and I’ve not looked back since. 2. What is your favourite piece of research? The yet-to-be-published stuff I’m working on now. If you’d asked me that 3 years ago, I’d have said the same thing, and if you ask me again in 30 years I’ll probably still respond the same way – it’s one of the great things about being a scientist – finding out what’s just around the next bend! 3. What do you think is the most interesting or important discovery in your field in recent years? Less of a discovery, and more of a general shift in understanding, track workers are really starting to get into the mechanics of how tracks are made, and what they can tell us about the animals that made them. There have been some really insightful experiments involving emus and elephants in the past few years. There’s also the technology being applied; in just the last 5-10 years digitisation techniques have gone nuts, from laser scanning to photogrammetry. Where previously larger studies based on published data pretty much just had outlines and photos to work from, we’re starting to see papers published which include topographic height maps, normal mapped images (making edges clearer), and even in some cases we’re seeing papers submitted to online journals such as PLoS 1 and Palaeo Electronica where the digital models serve as appendices. The implications for repeatable studies, data sharing, and general scientific progress in the field are staggering. 4. What do you think is the biggest unanswered question in your field right now? Probably how much information is locked away in tracks. How much can we learn from them? People have been really starting to look in a systematic way at how vertebrate tracks can vary in morphology according to substrate conditions, animal behaviour etc. I’m also a fan of the bigger picture that we can get from tracks – looking at evolutionary trends and so forth. Because tracks are always preserved in situ, they’re a really valuable resource – if they can be assigned and understood, which is where the first part of this answer comes into play. 5. What advice would you give to students about research? Just before I started my PhD, I had been volunteering at the Yorkshire Museum where a colleague said to me “If, when doing your PhD, you ever get up in the morning and wish you were doing something else, quit.” When I recount this to my present colleagues some agree, and some grumble and say there will always be somedays when you want to be somewhere else (usually paperwork days rather than research days). They are of course correct, but I think it’s the attitude that’s important. With the same qualifications, you can get far higher paid work outside of academia. The perks of a research career are that you get to do what you love – it’s genuinely exciting, and that excitement breeds curiosity. With excitement and curiosity, you’ll do the reading with ease, and you’ll work late on experiments/fieldwork. Essentially if you keep loving research, you’ll work hard.